A primary reason why an overwhelming majority of new retail district developments are predominantly leased to national chains rather than local independent businesses is that chains can pay higher rents. They’re able to do so because they already have an established customer base at the opening of any new location. This makes it extremely difficult to establish a natural cultural district of local restaurants, shops and entertainment venues, which is why we have ‘Anywhere USA’ instead. How can local indie shops and restaurants compete with such a crippling financial disadvantage? 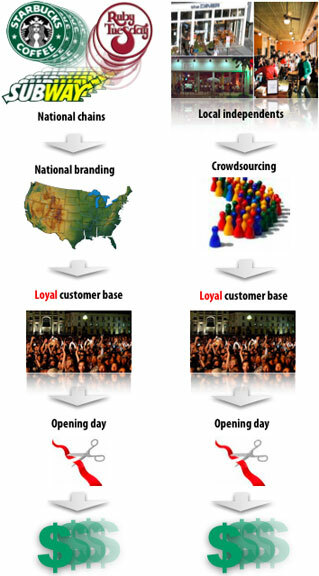 They can tap into the same branding approach branding that chains do, except instead of a national brand, they need to crowdsource a community brand that ensures a large, loyal following on opening day. How much easier it would be to compete with a loyal following of several hundred customers already eagerly awaiting the business’s opening day. Check out the process here. So, the question is, why aren’t more business owners doing it? The reason is pretty clear: Most business owners have typically already fallen in love with their dream of opening their business as they envision it, not what anyone else says, not even their future customers. It’s the ones that truly want to listen to the brightest, most creative members of the community that will embrace the crowdsourcing model and be able to truly compete with the nationals.